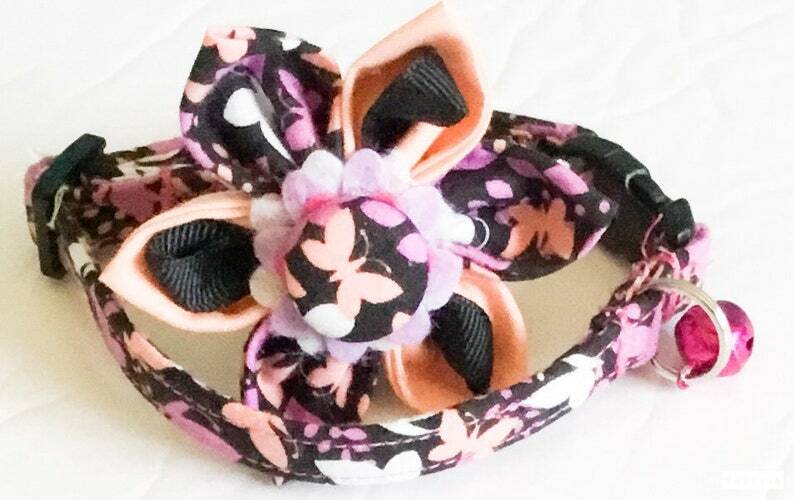 This listing is for a Pink and Black Butterfly Breakaway Cat Collar ONLY and it comes with a bell. THE FLOWER IS AN AVAILABLE OPTION IN THE SIZE SELECTIONS WHEN ORDERING. This breakaway butterfly collar can be purchased with a variety of buckle colors in the options when ordering. ALL CAT COLLAR HARDWARE CAN BE SELECTED IN 3/8”W, 1/2”W AND 5/8”W. ALL 3/8”W CAT COLLAR HARDWARE COMES IN MULTIPLE COLLARS AS SHOWN IN THE IMAGE. PLEASE MAKE A NOTE OF THE COLLAR COLOR THAT YOU WOULD LIKE IN THE COMMENTS SECTION TO ME WHEN ORDERING IF IT IS OTHER THAN WHAT I SHOW ON THE SAMPLE COLLAR LISTING. BOTH THE 1/2”W AND 5/8”W BREAKAWAY HARDWARE ARE ONLY AVAILABLE IN BLACK AS THE BUCKLES ARE SPECIALIZED BREAKAWAY BUCKLES. All cat collars can be made in asizes including XXS, XS, and S with option band width sizes of 3/8, 1/2”W and 5/8”W. ALL 1/2”W AND 5/8”W BREAKAWAY HARDWARE BUCKLES COME IN BLACK ONLY. ALL 3/8”W BUCKLES COME IN MULTI COLOR SELECTIONS. ALL Cats receive collar breakaway hardware unless otherwise requested.